The Jones Storm Chaser is one of their first surf rocker boards in the line. We were lucky enough to get it in some powder and make some turns. It wasn’t a groomer board compared to Jones’ hybrid camber rides like the Hovercraft or Flagship but it was better than we thought for that kind of super off the tail ride. To us, the Mind Expander just had our number but the Jones Storm Chaser floats incredibly well for its size and could have yours. The Carbon fiber strip in the 2019 Jones Storm Chaser improves the long-term flex as well as adds a little extra pop but overall it’s very similar to the 2017 and 2018 models. Approximate Weight: Felt pretty light but also not like a featherweight. Flex: Pretty medium to medium stiff. Sizing: This little 147 had more than enough volume going to handle all of us. It’s hard to wrap your head around it if you are about to retire a 180 something board from the early 2000’s and get a new powder board but when you try it you will get how much volume is underfoot. The 157 is more for the bigger booted guy. On Snow Feel: It’s not quite stable like the hybrid camber jones boards but it’s also more stable than most continuous rocker boards we tried. It seems like there is just a little flat between the feet to keep this from becoming an auto buttery mess. It can one foot off the chair and flat base pretty well. Edge Hold: Same great Jones mellow mag grip that doesn’t own it on ice but gives you grip for most conditions you will see. I could drop in on a hard patch at a peak on the way to powder knowing that the edge will hold till I get to the good stuff. Glad it’s there. Turn Initiation: Even though the Jones Storm Chaser is a short fatty with a massive waist size it’s quick and easy to weave in and out of the trees. I personally liked the Mind Expander a little better but this is very good. Turning Experience: In the little bit of groomed snow, I had near the chair, I didn’t feel it was that great of a turner. 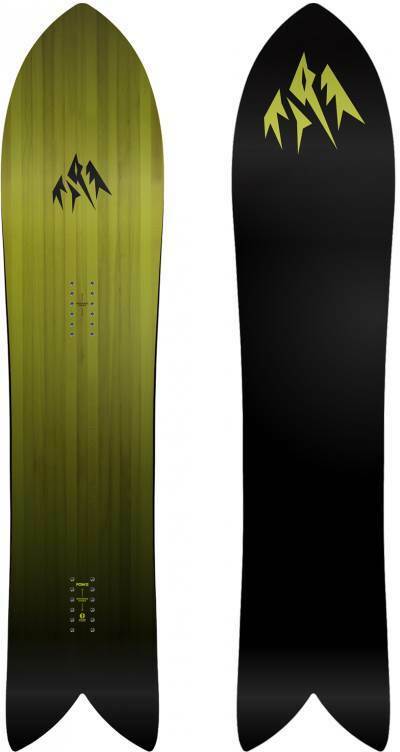 It’s great for how much rocker it has and does way better than you would think but it’s far from the first board I would want to bring out when the powder is gone. Carving: I’ve seen Jeremy carve up groomers with this and it’s amazing but personally I’d much rather be out on the Hovercraft or Flagship instead. 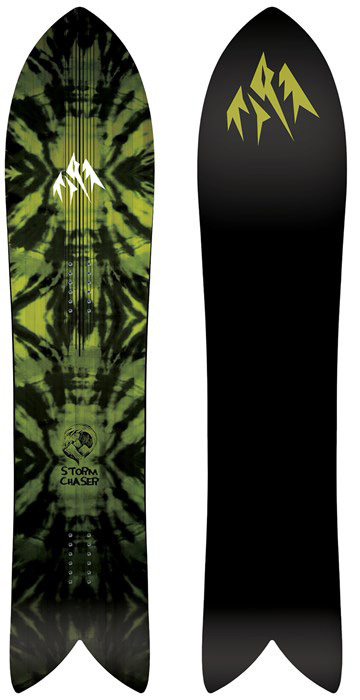 The Jones Storm Chaser hurried me through a carve and didn’t really give me what I want when I lay it out. That being said I’m surprised it didn’t wash out and I was even able to carve it up with all that rocker. Skidded Turns: So easy to skid turns and it’s super forgiving if you get off your game. Speed: It can bomb in powder with competence but all that rocker isn’t going to be ideal in groomers. Uneven Terrain: I’d rather be on the Mind Expander when it comes to weaving in and out of bumps and messy piles of snow but the Mind Expander can work rather well. Powder: This is why you buy the Jones Storm Chaser. It’s a champ in the powder and really makes you feel like you are surfing snow. It’s not a favorite but man it’s an easy floating fun turning ride in the somewhat thick Sierra snow we were in. Buttering: Much easier to butter than you would think for the flex but that is because of the rocker. Switch: Scary to even think about doing it. Jumps: There is good pop here and I’m not sure why but it can Ollie rather well. Pipe: Here is the weird thing. I didn’t try this in the pipe but thinking about it doesn’t make me feel scared to do so. There is enough edge hold to make it happen and it seems like it would drive wall to wall better than you would think just like it did on a carve. So overall I don’t feel the Jones Storm Chaser is the all conditions ride they say it is but it’s a super fun powder board and a better groomer board than you would think for its camber profile. I personally have a thing for the Mind Expander but if it dumped me I could pick up the shattered pieces and make a beautiful life with the Storm Chaser. We try to get as many images of the Jones Storm Chaser, but forgive us if they're not all there. After 5 full days on the 2019 Storm Chaser 152 I feel like I'm starting to get an idea of what this board is really capable of. Of course it's amazing in the powder, the big nose gives it float for days and you don't even have to think about leaning back. I've found it to be incredibly fun in the trees too-that combination of rocker and a short tail makes it really fun and nimble and you can weave through tight, steep trees with almost no effort. I think this board is actually a lot more versatile than it would seem, once you get used to its turn radius it can really carve and lay a trench. It's a really particular style of carving, very off the back foot, but it has really solid edge hold in most kinds of snow. It's also really fun pop a 180 and see how long you can hold a butter off the nose. Speaking of pop, it has way more than you would expect but landing with that almost nonexistent tail takes some getting used to! All in all I've found it to be a ridiculously fun board, like James has said it's kind of the snowboard equivalent of riding a fish if you know what that means! When it comes to riding powder, the Jones Stormchaser is a great choice. I’ve ridden the 147, and god this was fun. It has the best float in the deep and no need to lean back at all! Actually I would advise those who take this one out, to actually ride it without putting a lot of pressure on your back foot since that should bring you a little more stability and will allow you to take more aggressive lines without washing out. Considering its shape, it was expected of the Stormchaser to excel in powder, but the main reason why I would like to write a review about it, it's because of how well it did on the groomers. Obviously, you are not supposed to use this one looking to break speed records, but if you are looking for a fun, surfy ride, this one is hard to beat. The mellow magna-traction (signature edge design from Jones) gives you plenty of edge hold for those who like to lay on a carve. 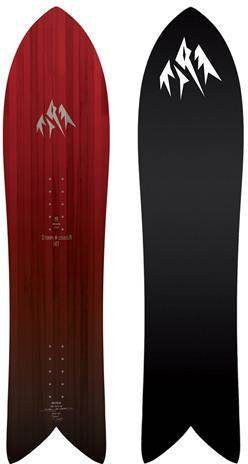 If you want to surf the mountain, this is probably one of your best choices in the market.